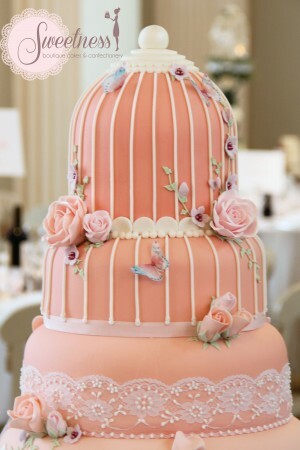 This is a Birdcage wedding cake designed for a wedding held at the Banqueting House at Whitehall, London. The ceiling of the hall was covered in beautiful alfresco paintings and the wedding was themed around a beautiful garden scene to make the most of the stunning venue. The cake was designed to fit into the theme. The colours mimicked the colours worn by the bridesmaids and got deeper to the top of the cake to bring the eye to birdcage at the top two tiers. 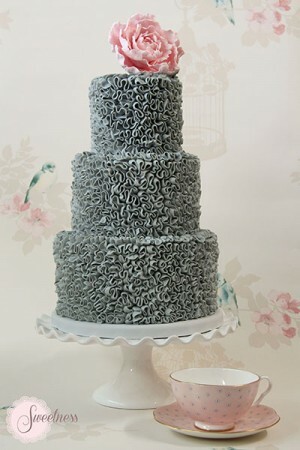 Everything about the cake was delicate, from the lace to the piping and the choice of flowers. Sugar roses and petunias adorned the cake with piped ivy trailing down the sides. Edible butterflies and falling rose petals finished the cake off to complete the garden feel of the cake. This is one of my favourite designs to date. The cake had pride of place in the hall as the centre piece for the reception. All the best to the bride and the groom! Buttercream Wedding Cakes are becoming more and more popular. I personally think wedding cakes covered in only buttercream can look just as beautiful as their fondant covered counter parts. Buttercream is very versatile and can be piped into various patterns unto your wedding cake or it can be skimmed into a silky smooth finish similar to a fondant covered cake. A popular trend is to create rustic patterns unto the buttercream using a palette knife and finish the cake with fresh flowers or herbs. This looks particularly beautiful in a country side wedding setting. Buttercream can be coloured to match the theme or colour scheme of your wedding. It can be layered to create a three dimensional look. The possibilities are endless! There are a few types of buttercream to choose from: American, Swiss, French. Each has it’s own flavours and textures. Some are richer than others, some are lighter in texture. Your choice of buttercream will come down to your individual tastes as they all have their selling points. I hope you have a look at some of the buttercream cakes on our website. 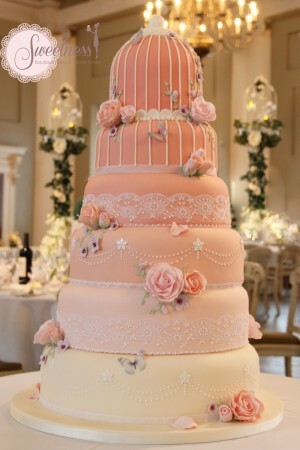 Sweetness Cake Boutique London create bespoke wedding cakes and confectionery in the London and Greater London area. Please contact us with any enquiries.